Think you know your way around a potato? Think again. Our chefs and food bloggers have been busy in their kitchens devising some cracking new recipes to give this humble ingredient the attention it deserves. Potatoes are a staple in most of our homes, and we’re always on the lookout for new things to do with them. Don’t get us wrong – there will always be a place in our hearts for a good chip, a baked potato or a huge pile of buttery mash, but variety is the spice of life and we’re always looking to broaden our horizons. Speaking of variety, potatoes may have a reputation for being slightly middle-of-the-road, but they’re actually incredibly varied. Most of us know the difference between a floury Maris Piper and a waxy Jersey Royal, but there are over 4,000 different varieties of potato in the world covering a huge spectrum of colours, flavours and textures. Naturally, different potatoes are better for different things – we’re used to using floury potatoes for roasting and using new potatoes for boiling, but things don’t always have to be this way. New potatoes, for example, make great roasties, and there’s loads you can do with a good floury variety. Next time you’re planning dinner, why not mix things up a bit? Try a different variety of potato or a new cooking method – you may be pleasantly surprised with the results. 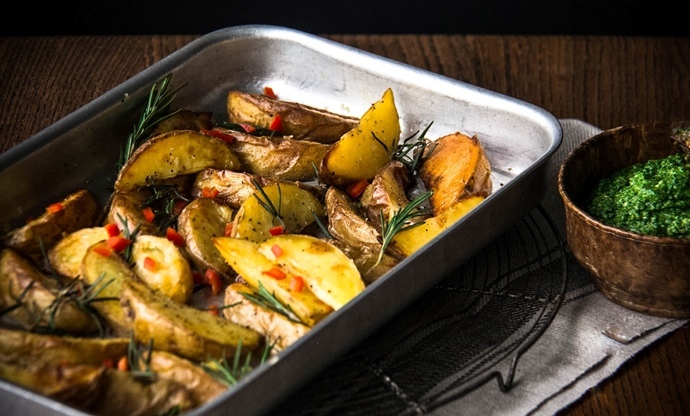 Read on for six potato recipes devised by some of our favourite chefs and food bloggers. We're sure they'll lend some inspiration to your next cooking session and celebrate everything great and good about the humble spud. 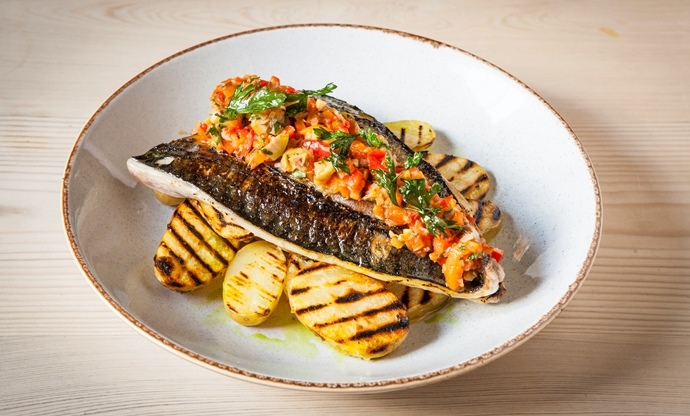 The clean, Mediterranean flavours of Emily’s mackerel with sweet pepper salsa speaks to her time as a chef in Italy before she returned to the UK. She gives the salsa real piquancy with the addition of olives, chilli and anchovies, which helps to perfectly cut through the fatty mackerel. Underneath, her treatment of the potatoes is genius – they’re par-boiled and then charred on a griddle pan, giving the whole dish a lingering smoky finish. Celandine is a waxy potato variety with a firm texture, which means they will stand up to being chargrilled without falling apart. 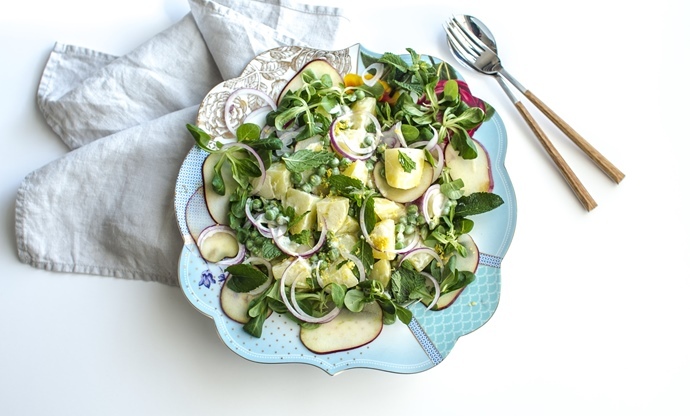 This lively salad plays to the strengths of waxy baby potatoes, marrying them with clean flavours in a delicious salad. These potatoes are good enough simply boiled in salted water, but when matched with fresh peas, slices of apple, red onion and plenty of fresh mint, they truly sing. A simply yoghurt dressing really rounds things off, lifting the sweetness of the salad with a hint of sharpness. Celandine potatoes are sold in Co-op stores under the name 'Co-op Irresistible Baby Potatoes'. From her restaurant in the beautiful, verdant Cotswolds, Emily Watkins’ cooking shows a real mastery of English garden flavours. 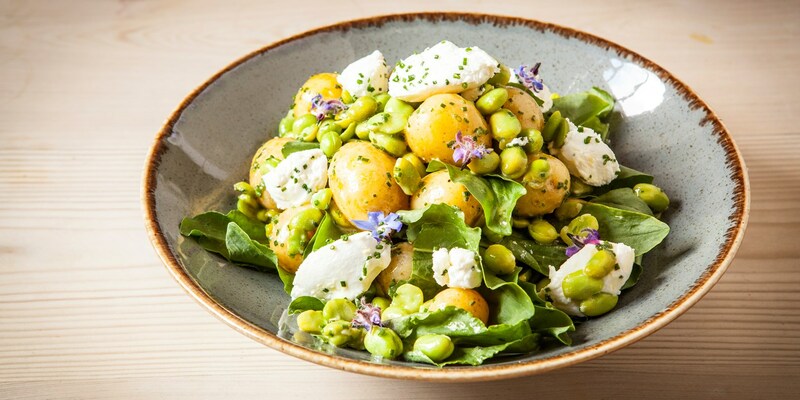 This gorgeous salad of Perline potatoes, goat’s cheese and broad beans is a perfect encapsulation of summer. 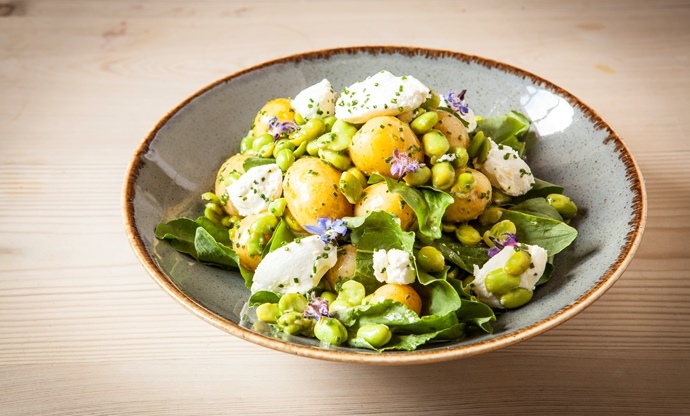 The key lies in doing simple things well – Emily blanches her broad beans just long enough to retain a bit of bite and boils her potatoes with mint for an extra fresh flavour. A simple Dijon mustard dressing, a handful of sorrel and a few lumps of goat’s cheese is all that’s needed to finish things off. Perline potatoes are particularly good for boiling and serving in salads as this allows their unique, pronounced flavour to shine through. Rosana McPhee’s new potato skewers may look simple, but there’s some smart cooking going on behind the scenes. 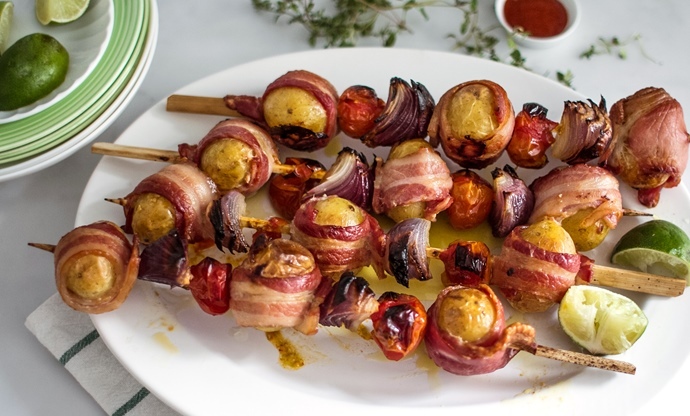 She par-boils her potatoes in salted water, then wraps each one in a piece of bacon, placing it on a skewer with chunks of red onion and cherry tomatoes. As the bacon cooks on the barbecue, the fat renders and melts over the potatoes, infusing each with delicious bacon flavour. A dressing of lime juice and chilli helps to cut through the fat and adds a zingy finish. Perline potatoes are sold in Sainsbury's under the name 'Sainsbury's Taste The Difference British Gem New Potatoes'. They're available between May and October. Larner potatoes are rich, buttery and sweet, and their texture is perfectly suited to roasting. Emily Watkins keeps things simple yet incredibly delicious with her pork shoulder, simply flavouring it with fennel, garlic and lemon. 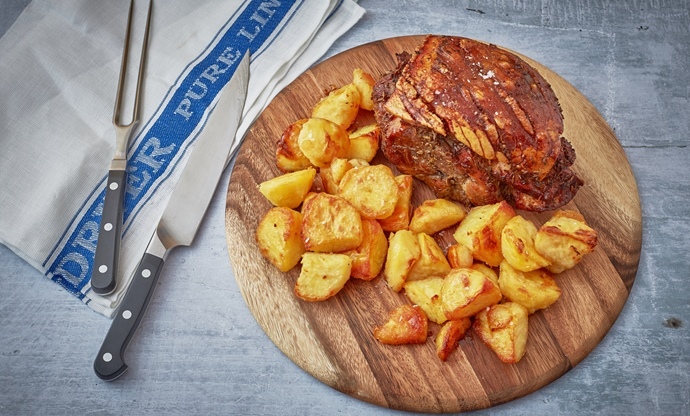 As the pork cooks, the fat renders down and is absorbed by the potatoes in the same tray, lending plenty of rich indulgent flavour to the spuds. Few things are more comforting than a pile of rustling potato wedges, and they're the perfect vehicle for all sorts of bold, flavourful sauces. Here, the potatoes are cooked in a rosemary and chilli-infused oil, a great match for the wild rocket and walnut pesto dip served alongside. Larner potatoes are sold in Co-op stores under the name 'Co-op Irresistible Roasting Potatoes'. 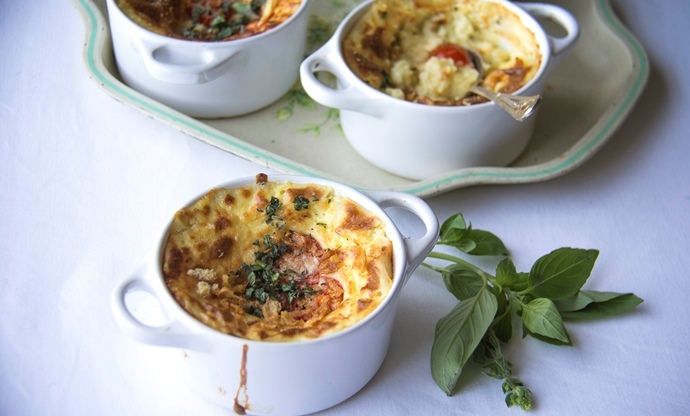 This is pure comfort food in a bowl – a silky smooth combination of mashed potato, cheese, egg, cream and herbs baked together until golden brown and bubbling. The crispy shallots and halved tomatoes finish it off perfectly. Just the thing for when you're after a quick, simple and totally delicious dinner. Lamb neck is a woefully underused cut of meat, but Emily Watkins gives it the attention it deserves in this stunning recipe. 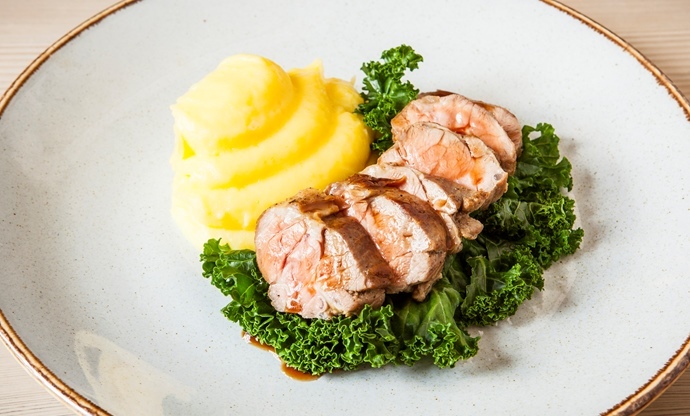 Brining the lamb means it'll stay wonderfully moist and juicy during cooking, while the stunning mashed potatoes on the side are made with smoked rapeseed oil, giving them a savoury boost of flavour that complements the main attraction perfectly. Lilly potatoes are sold in Co-op stores under the name 'Lilly Mashing Potatoes'.